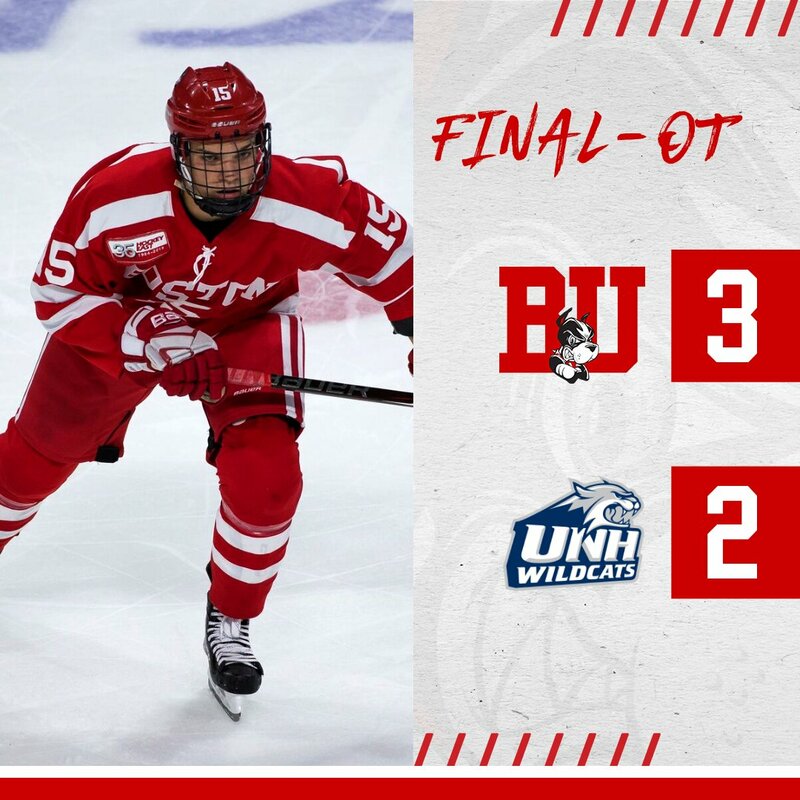 Sophomore Shane Bowers’ shorthanded overtime goal—at 3:06 of the extra session—sent BU home from the Whittemore Center in Durham with a hard-fought 3-2 win against New Hampshire. It was the second goal of the game for the Nova Scotia native who had also delivered an overtime winner in the 5-4 exhibition win against the NTDP U18s. The win gave BU a three-game unbeaten streak, after beginning the season with four losses. As they’d done last Saturday against Northeastern, BU took an early lead, converting their first power play opportunity with junior Chad Krys firing home a wrist shot from the left circle. Co-captain Dante Fabbro and Joel Farabee assisted. The Huskies matched that score with a man-advantage goal of their own from Ara Nazarian, who gained position in the crease and slid a rebound past Jake Oettinger. Two minutes later, BU was back on the power play and Bowers backhanded home the rebound of a Farabee shot with co-captain Bobo Carpenter getting the second assist. The Terriers nearly added another with six minutes left in the first when Max Willman’s slapper rang off the post to goalie Ty Taylor’s glove side. BU maintained the 2-1 lead until the 14:05 mark of the second period when UNH’s Jackson Pierson scored on a two-on-one rush just three seconds after the Wildcats had killed a Terrier power play. Terriers had a power play early in the third period but failed to break the tie. Midway through the period, Oettinger made a series of tough saves to keep the game tied. In overtime, with BU killing a Farabee penalty, Fabbro’s clearing pass up the right boards skipped past a Husky defender. Bowers won a race to the puck, broke in on Taylor and ripped a shot past him high to the glove side. Oettinger finished with 17 saves, while Taylor stopped 23 BU shots. BU had a strong night in the faceoff circle led by Ty Amonte winning 11 of 16 draws and Bowers winning 10 of 17. For BU, which produced a shorthanded score for the third consecutive game, the win was its sixth in the last eight games against UNH with two ties. 2021 recruit Danil Zhilkin is ranked #9 for the 2019 OHL draft by Prospect Pipeline. Chris Bourque and Kieffer Bellows each scored a goal in AHL Bridgeport’s 5-4 overtime win against Providence. Connor LaCouvee made his AHL debut in a 52-minute relief effort for Utica, stopping 19 of 21 shots in the Comets’ 5-1 loss to Binghamton. LaCouvee began the season in the ECHL with Maine where he had a 2.57 GAA and a .929 save percentage.